Are Acidifying Oceans Slowing Down Coral Disease? Could acidifying oceans actually slow down coral disease? A controlled lab study led by Mote Marine Laboratory and published in the journal PLOS ONE revealed that black band disease was less deadly to mountainous star coral (Orbicella faveolata) as water acidiﬁed, or decreased in pH. Scientists from Mote and the University of South Carolina, and students from the University of Rhode Island, University of New Hampshire, University of Hawaii, and Unity College in Maine conducted the research with funding from the Dart Foundation and the Protect Our Reefs grants program supported by sales of the Protect Our Reefs specialty license plate. Student contributions were backed by the National Science Foundation (NSF) Research Experiences for Undergraduates program and Mote College Internship Scholarships. Scientists from Mote and the University of South Carolina, and students from the University of Rhode Island, University of New Hampshire, University of Hawaii, and Unity College in Maine conducted the research with funding from the Dart Foundation and the Protect Our Reefs grants program supported by sales of the Protect Our Reefs specialty license plate. Student contributions were backed by the National Science Foundation (NSF) Research Experiences for Undergraduates program and Mote College Internship Scholarships. The ocean’s pH is decreasing through the process of ocean acidiﬁ cation (OA) driven by excess carbon dioxide, the same greenhouse gas that’s triggering temperature increases worldwide. OA may weaken or dissolve corals’ hard skeletons and bring on other changes in multiple marine species. Warming water stresses corals, causing them to lose the vital algae in their tissues. Coral diseases, another major threat, may worsen in stressed corals, but few studies have examined how these conditions could change amid low pH levels expected with OA. The new study is the ﬁrst to examine how low pH water affects black band—a fast-progressing, often deadly, worldwide coral disease affecting at least 42 coral species in the Caribbean. Black band, a variable group of multiple bacteria species, forms a dark circle that spreads across a coral and kills it. Under attack is mountainous star coral, a major contributor to the reef system of the Florida Keys and listed as threatened under the U.S. Endangered Species Act. “Mountainous star coral only grows a couple of millimeters a year, and black band can kill a 100-year-old coral within weeks,” said Dr. Erinn Muller, lead author and manager of Mote’s Coral Health and Disease Research Program. At a very small scale, black band produces a lower pH environment than its surroundings—localized acidiﬁ cation. “In the lab, we thought that exposing an infected coral to acidiﬁ ed water would accelerate the virulence of this disease, but to our surprise, the opposite happened,” Muller said. During 2013 lab work at Mote’s Summerland Key campus, the researchers inoculated 32 mountainous star coral fragments with black band disease. Some were placed in tanks with temperature and pH similar to present-day ocean water, while others were put into tanks with elevated temperature, lowered pH or both. They used year-2100 projections from the Intergovernmental Panel on Climate Change’s Fifth Assessment Report. The researchers carefully monitored the water conditions and photographed and measured the coverage of black band for 16 days. By then, some coral fragments had perished completely from the disease. 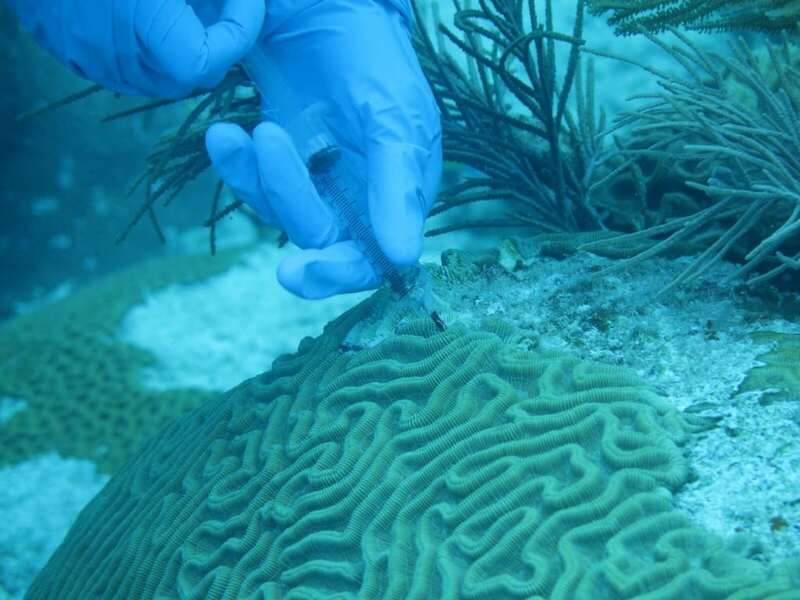 The team sampled black band bacteria and the corals’ natural resident bacteria—some of which contribute to the coral immune system—and sequenced their 16S rRNA gene, which helps classify bacteria into scientiﬁc categories. Their analysis revealed a surprise. “Though warmer temperatures didn’t signiﬁcantly affect the progression of black band disease in this time period, the low pH treatment did—it slowed the progression rate of the disease by 25 percent,” Muller said. 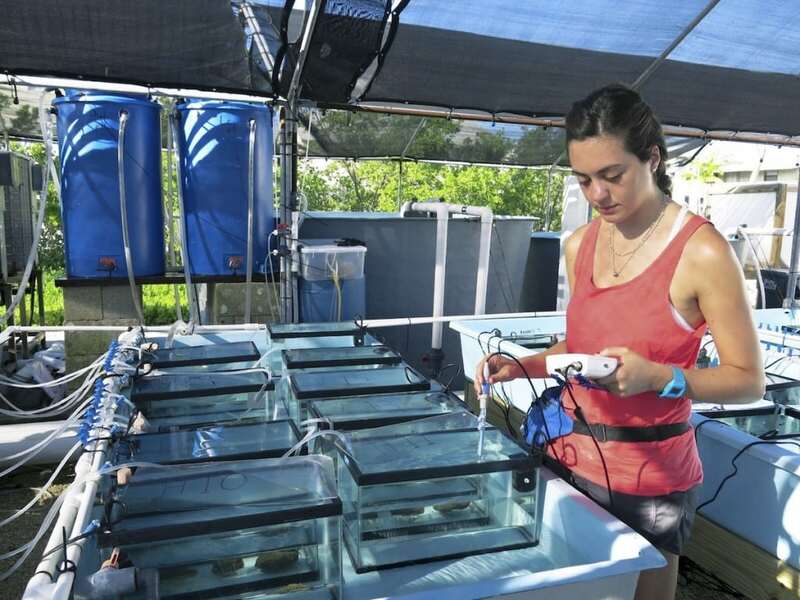 “It took us awhile to believe it.” Skeptical, Muller and her colleagues ran similar tests with other coral species apart from the mountainous star coral in the current study. The mountainous star coral showed the clearest trend, but data from other species suggested similar patterns. How might acidiﬁcation slow down black band disease? “Black band disease has a very distinct consortium of microbes, and it seems that lowered pH affected different microbes in different ways,” said study partner Dr. Kim Ritchie, associate professor at the University of South Carolina at Beaufort. “The abundance of one signiﬁ cant member of the consortium went down.” Speciﬁcally, acidiﬁed water reduced the abundance of Oscillatoriophycidae, a class of cyanobacteria that often dominates black band disease. These bacteria carry pigments that give the disease its distinct color. Though these bacteria live in the already-acidiﬁed environment of black band, past studies by others suggest that cyanobacteria can decline if the water becomes acidiﬁed beyond their tolerance limits.